If there’s one constant in this world, it’s the fact that summer flies by every year. Before you know it, kids in our community will be heading back to school (which we’re sure they are really looking forward to…). In the Richardson Independent School District, classes begin on August 21. This means that if you haven’t started your back-to-school shopping already, you will soon! One of the big parts of this is getting new clothes for your children, including footwear. We want you to be able to make the best choices when it comes to the shoes your sons and daughters wear, so we feel this is a good time to share some shoe shopping tips for children’s footwear. Bring your child with you. Depending on stage of physical development, a child’s shoe size can increase as often as every couple of months. This makes sense when you think about feet being the base of the body, and needing to support everything growing above them! 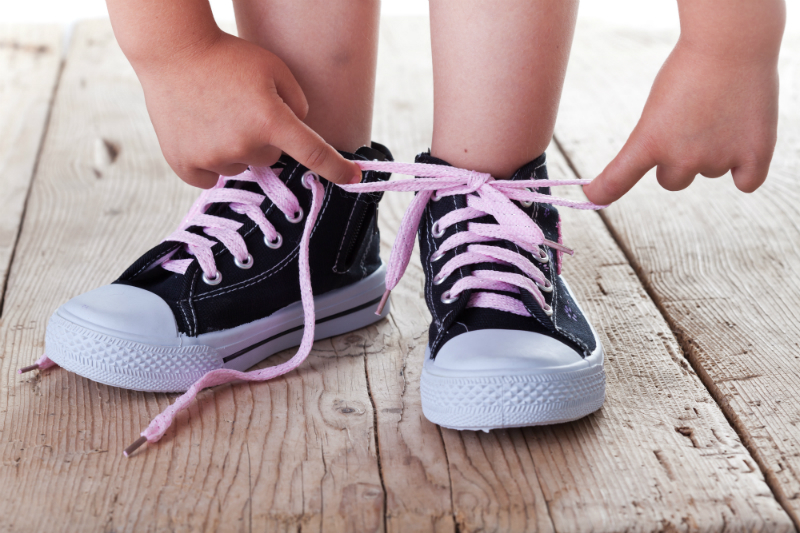 When your child outgrows his or her current shoes, bring him or her with you to the store. Shoe sizes can differ between manufacturers, and sometimes even within brands. It’s best practice to have your child actually try on footwear before you buy them. Fit the pair of shoes to the larger foot. Almost always, one foot is larger than the other. With this being the case, have both of your child’s feet measured. Then, pick out shoes based on the size of the larger foot. Check for proper fit. Using the larger foot, feel for the largest toe and its placement within the shoe. There should be roughly a thumb’s width of space between the front of the shoe and that toe when the shoe’s laced (and the heel is cradled snuggly). Do not buy shoes and plan on a “breaking-in” period. Put simply – if a pair of shoes are not immediately comfortable for your child, do not purchase them. The right shoes can make a big difference in the health of your child’s feet, but even the best footwear cannot completely eliminate all injury risk. If your child develops a foot or ankle problem and needs expert treatment and compassionate care, reach out to our office so we can help. Call Richardson Podiatry Center today at (972) 690-5374 for more about our child foot care services. ?How Do I Care for my Ingrown Toenail from Home? ?Does Running Make Ingrown Toenails Worse?